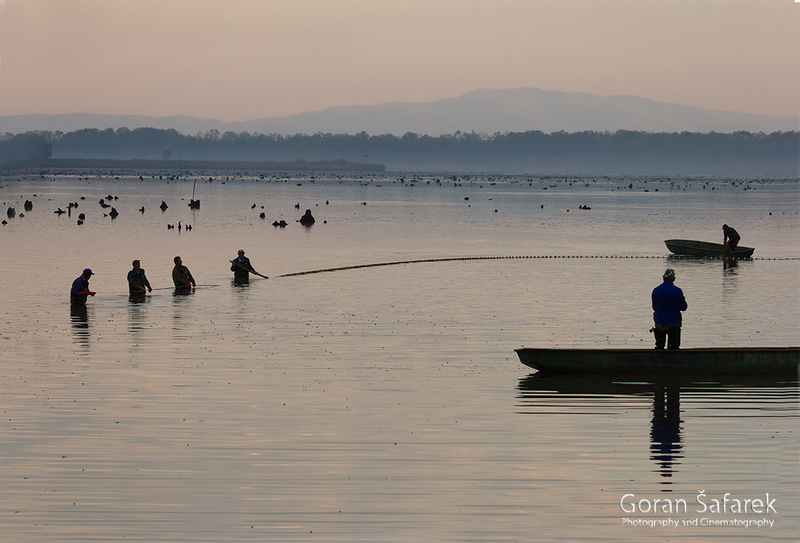 Crna Mlaka - world renowned marshland at the doors of the capital - Explore Croatia Become a Patron! 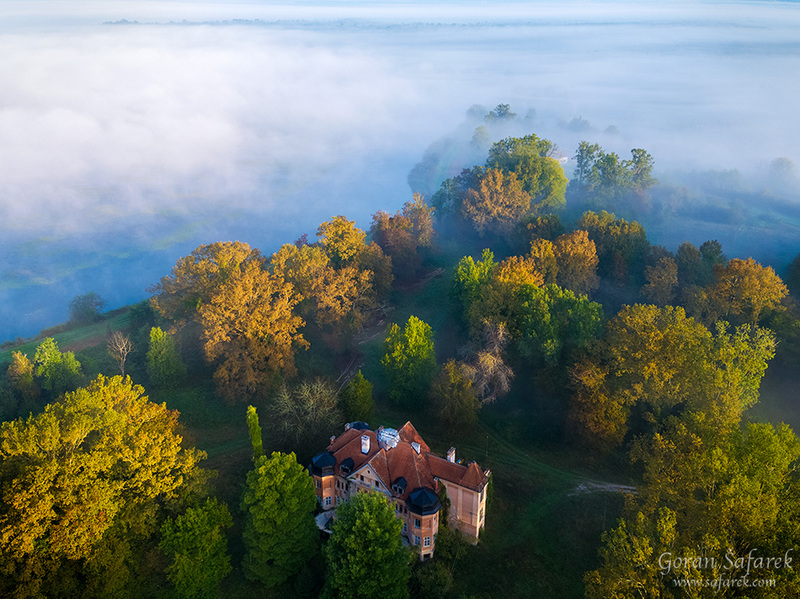 Crna Mlaka is located in the vicinity of Zagreb, but it looks as if it is the middle of the wilderness. 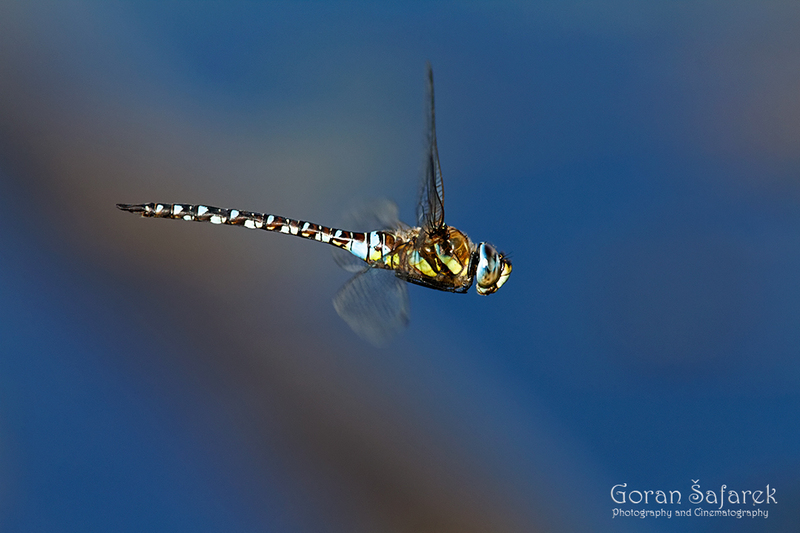 The area is teeming with animals, above all marsh birds. At the same time, Cma Mlaka is also a fish pond and a perfect example of the coexistence between man and nature. 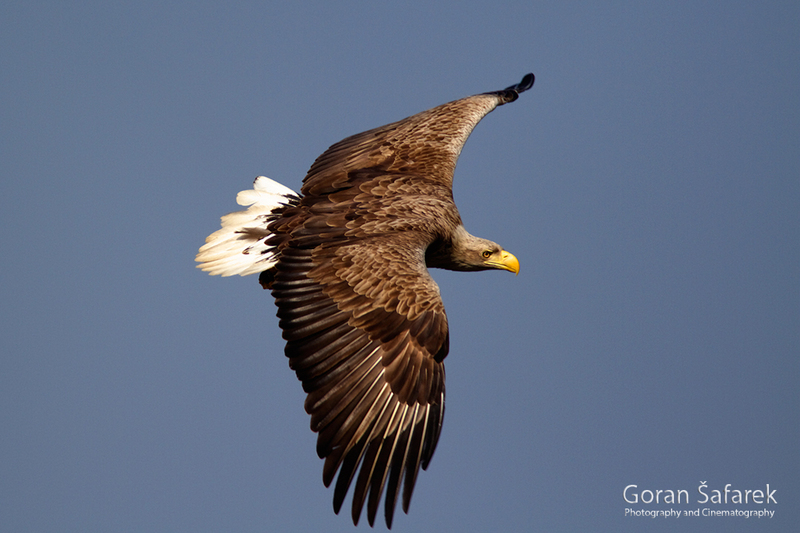 The white-tailed eagle seems to appear out of nowhere, That great brown bird with its white tall instantly causes a white cloud of feathers, beaks grid the long slender legs of hundreds of herons and egrets to lift from the lake. The commotion in the air lasts for a few minutes. However, with the departure of the bird of prey, the great white birds slowly return to the lake like snowflakes. It is as if snow has covered the water in the middle of warm and mild autumn when the leaves on the surrounding trees have just started to turn yellow. That is only one story about the twenty or so lakes of Crna Mlaka, the aquatic islands in the sea of the forested area along the Kupa River, known as PokupIje. In the shade of old oak trees are winding gravel forest roads, one leading from Crna Mlaka. After a few kilometers the path surprisingly runs into the highway In Jastrebarsko. This wilderness is but thirty kilometers away from the first skyscrapers of the Croatian metropolis! From a bird’s eye view, one can clearly make out the curved shapes and the lakes of various sizes. Some of them are the size of handball courts, while the others could accommodate about ten or so football pitches. Indeed, Crna Mlaka can be seen clearly from an airplane, but only when the thick greyish-white fog lifts, while the sun has already been shining elsewhere. Sometimes, it is not until about noon when the blue sky opens up, and the greenery glistens in the fresh brilliance of the morning dew. Actually, to see the water from the land, one would basically have to wriggle through the rustling and sharp stalks of tall reeds. That is not the end of the hardship – if someone tries to wade through the water, their legs will quickly sink into the soft mud, but they will not drown because the water only comes up to their waist. 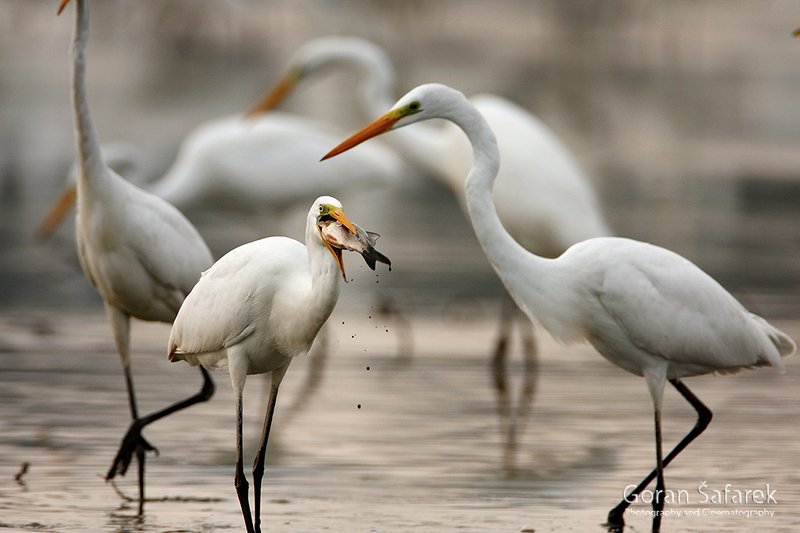 All of that effort is awarded an intimate look at the rich wetland life. 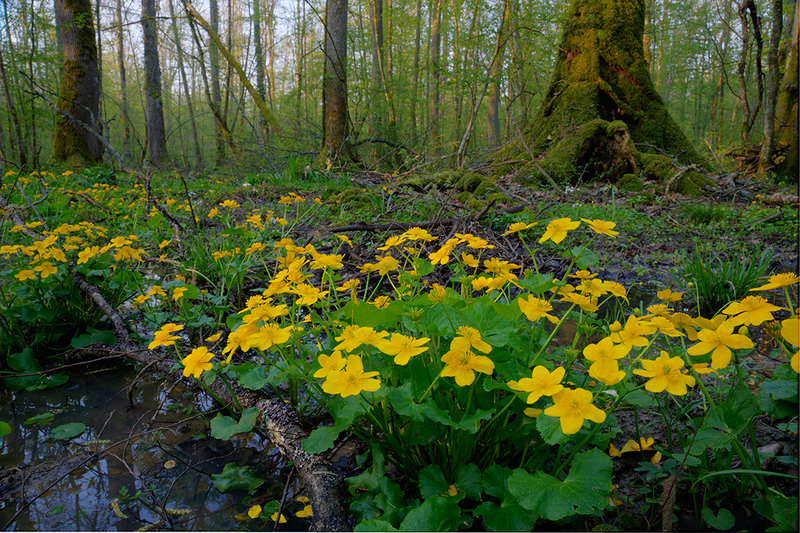 Thanks to the shallowness and the warm summers, the water is often covered with a yellow carpet of water plants. 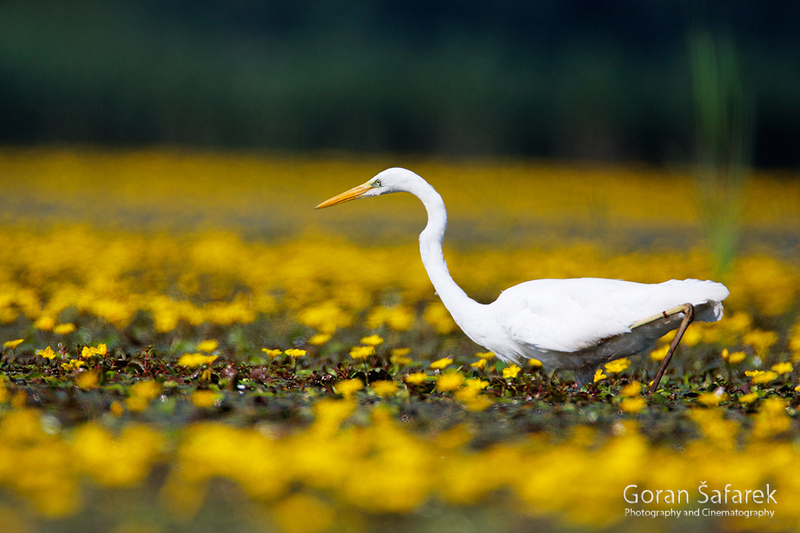 The great white egret, with its elegant appearance, is surely the most conspicuous actor on this swampy stage. However, that doesn’t mean that all the other birds have an irrelevant role. 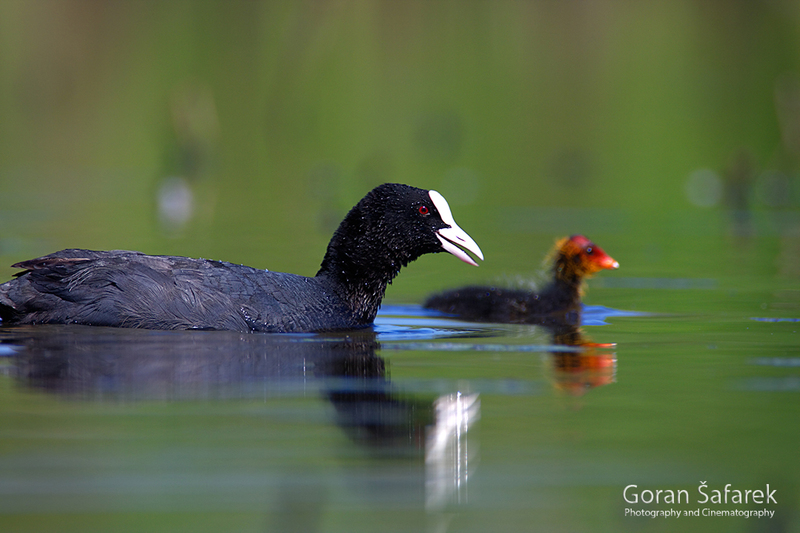 The coot population is probably as numerous. The size of a duck and utterly black except for its while forehead, these birds spend their entire lives on the water. They make their rough nests hidden in the reeds, where the females patiently sit on their eggs. 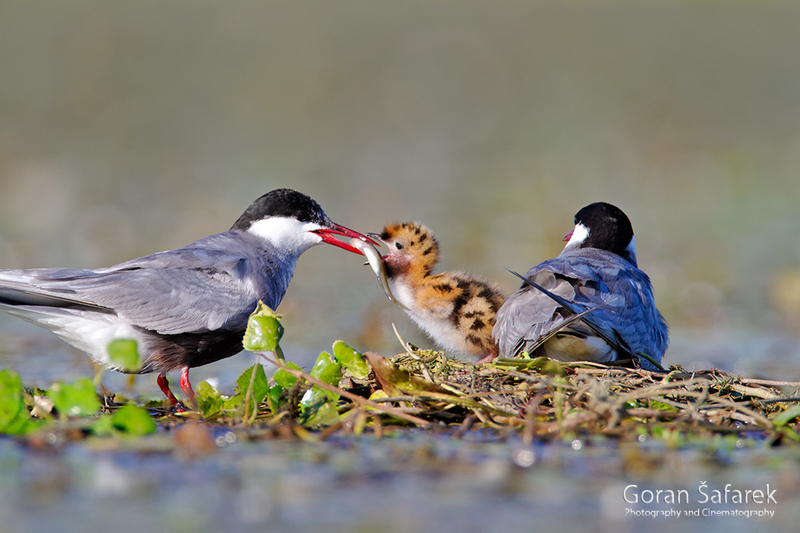 The hatched birds quickly enter the water and faithfully follow their mothers. 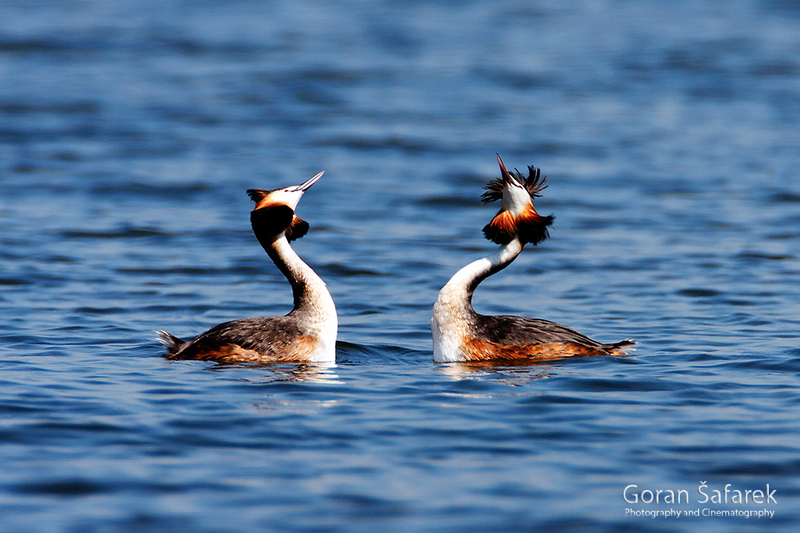 The great crested grebes have similar life stories. 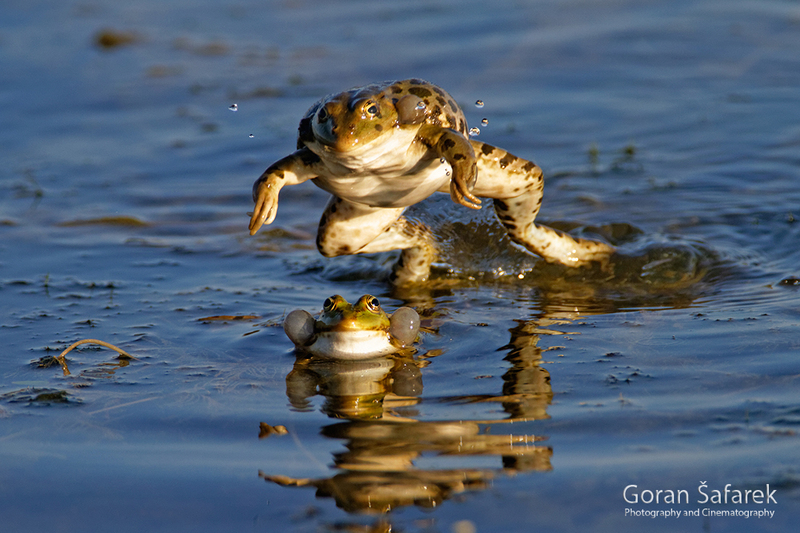 In the spring the males and females literally dance on the water, turning and facing one another. As if they were in a trance, they twist their long necks which are richly decorated with reddish-black manes. Loud and contentious are the black-headed gulls, which feast on the fish here. From the reeds, one can hear the incessant chirping of the great reed warbler. 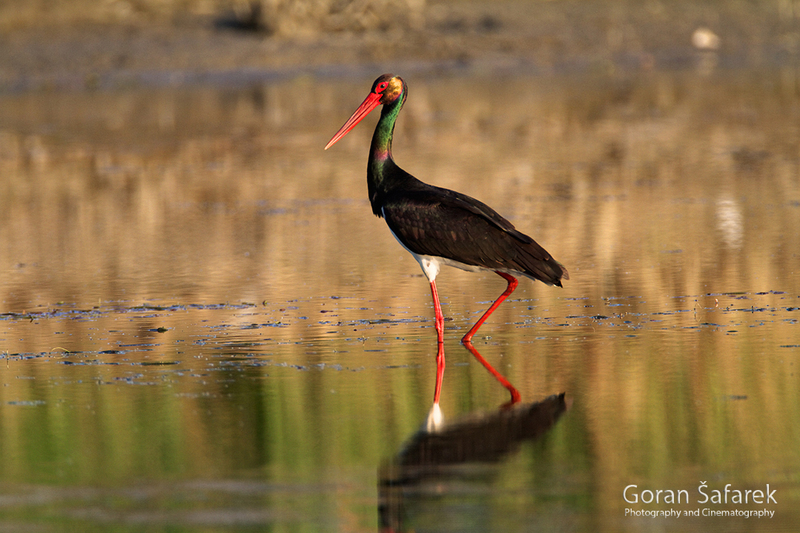 Black storks regularly come for their meals from the deep oak forest, and spoonbills drop by from the nearby colonies. 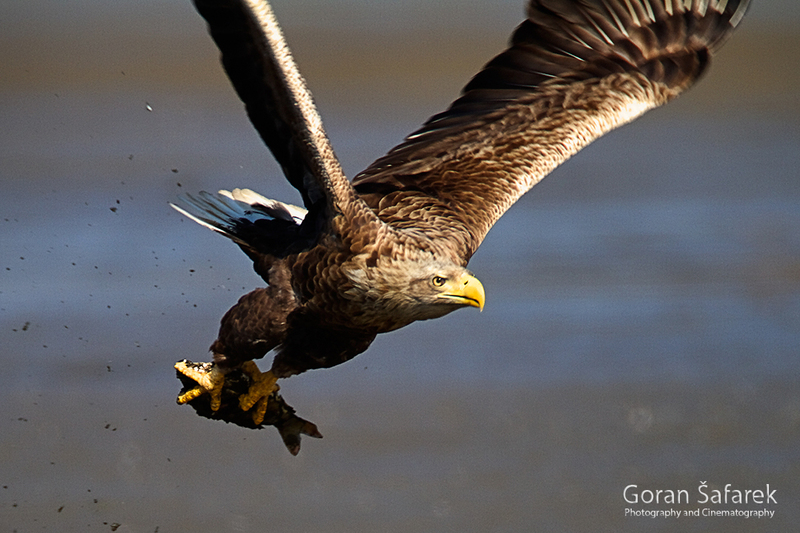 The fish, as well as the smaller birds, are preyed by the white-tailed eagles, black kites, harriers and other birds of prey. 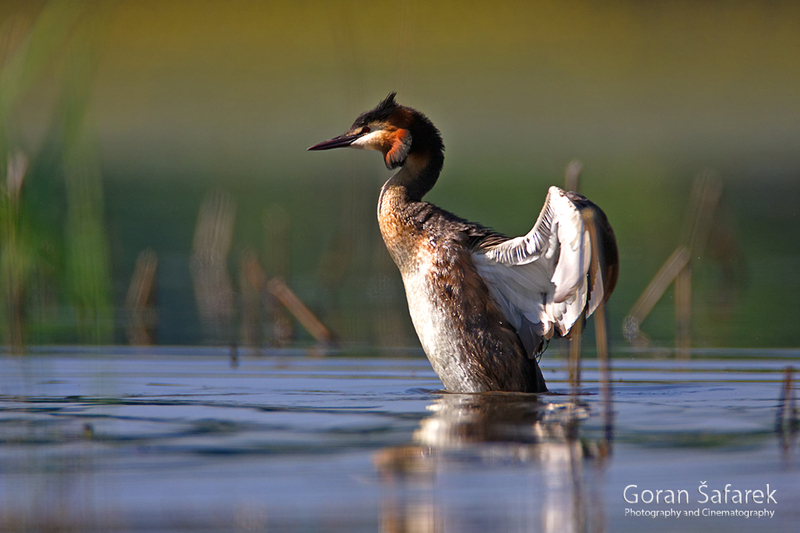 Ornithologists have recorded more than a total of 2O5 species of birds here, roughly half of all the species in Croatia. Otters find their home in hidden corners, and from the forest come roe deer, foxes, wildcats, martens and other mammals. But, the real stars of Crna Mlaka are the ducks. In the autumn, there are literally thousands of them. 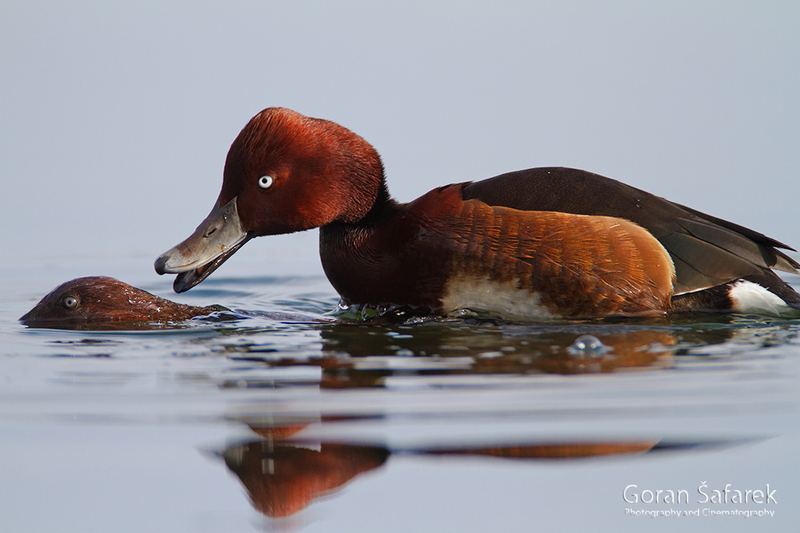 They are the ferruginous duck, easily recognized by the chestnut-brown ducks with the slightly dull bills. They calmly float in the middle of the lake together with the other ducks. Ferruginous ducks are one of the most endangered species of ducks in Europe, and their numbers are diminishing, but during the autumn more than five thousand of them gather at Crna Mlaka. This is quite likely their most significant gathering place in central Europe. 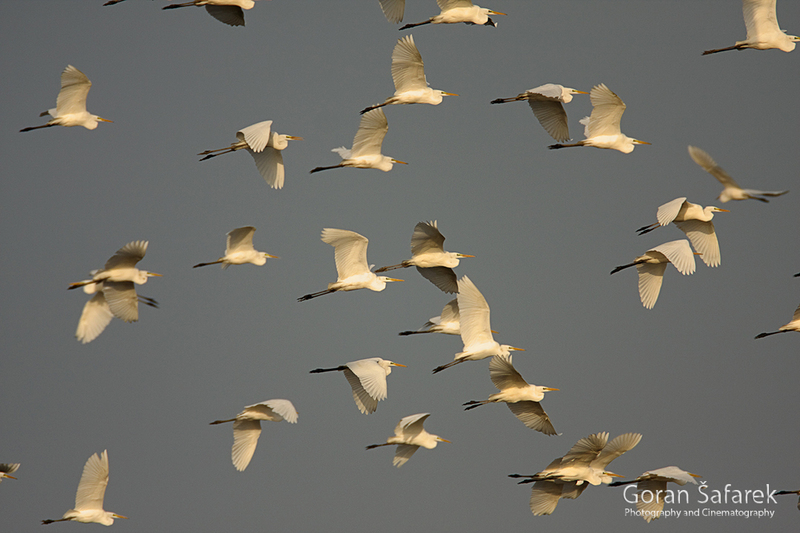 Those five thousand birds make up an extremely considerable part of the European population, which is an enormous number for such a small area. The ferruginous ducks are most often seen during migration when this fish pond is an important resting and feeding stopovers for the tired birds. 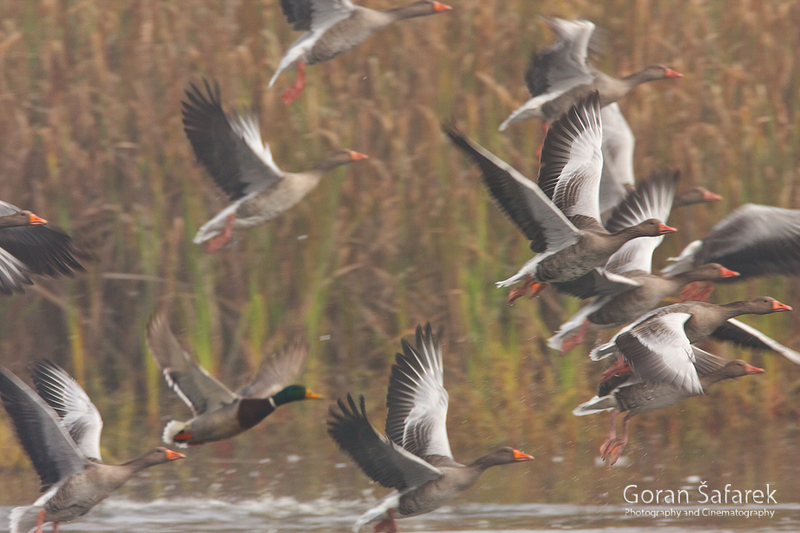 Crna Mlaka is the rare opportunity to see this many feathers and bills in Europe. The reason, however, is quite simple – there are no hunting rifles here. All around Europe, especially Balkans, the distraught birds shudder at the mere silhouette of a man, all because of the fatal shots of the hunters. 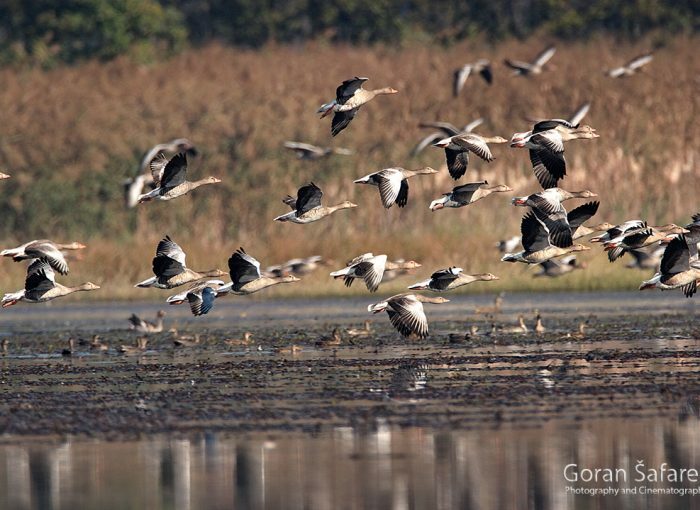 Therefore, the peaceful shelter offered by Mlaka means life for the ferruginous ducks. 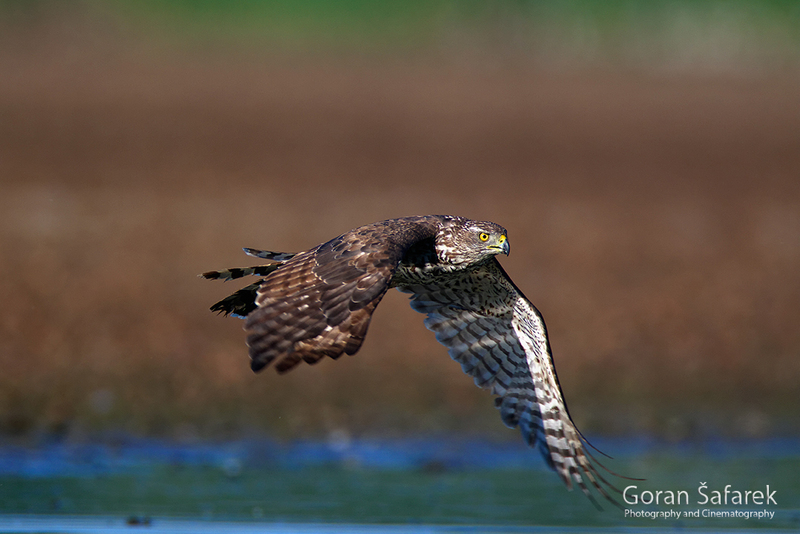 As a result of its value, Crna Mlaka is protected as a special ornithological reservation. It gained a global claim to fame when it was recognized as a Ramsar Site, named after the namesake Convention of Wetlands of International Importance (Ramsar Convention). It is not easy to become a member of this elite world organization because a site needs to meet stringent criteria to be proclaimed a Ramsar Site. Crna Mlaka shares the flattering title with many other larger and well-known regions in Croatia – Kopački kit, Lonjsko Polje, Vransko jezero and the Neretva River Delta. Scientists compare the natural wealth of the wetland areas with the tropical rainforests – just like the rainforests, wetland areas are gradually shrinking. 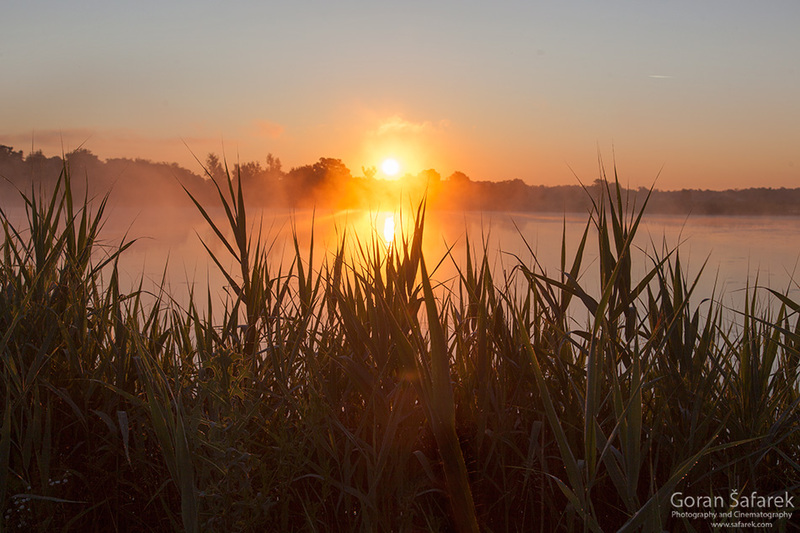 The wetlands do not only offer great biological diversity but also they purify the water from the contamination that comes from surrounding fields or settlements. Birds and animals are not the only occupants of Crna Mlaka. Houses rise from the water, literally, next to the birds, and well maintained white roads wind between the big lakes. Stretched between posts, fishing nets hung out to dry, reveal that this is actually a fish pond far carp. About a hundred or so years ago people cut down the forest, diverted the water from the surrounding streams, built dikes. To make it easier to transport the fish, they have developed a narrow-gauge railway. All of that was credited to the Austrian Cornelius, the first owner of Crna Mlaka. Zwilling made his stay more pleasant by erecting a castle, Ribograd (Fishtown), surrounded by a beautiful park with decorative trees and bushes. The castle still stands but is in a sorrow state, hopefully awaiting the day when the funds will be raised for its renovation. The employees take care of the fish pond all year long, but indeed the fishing activities reach their peak in late autumn. For weeks the lakes slowly lose the water, and then comes the day – fishing. The sun has not broken through the bare tops of the oak trees, but about fifteen or so people, despite the first frost, begin to encircle the fish. A large net has been set up around one part of the pond, and they begin to tighten it. Most of the workers are on the banks, pulling the net, but four of them are wading in the water up to their waists, maintaining the net’s position and stability. Little by little, the muddy water seems as if it is boiling as the fish are gradually forced into an increasingly smaller area. After the arduous pulling, the fish have only a few square meters of freedom in the net. It’s time for harvesting. Somewhat unexpectedly, heavy machinery appears on the stage – a yellow dredger with a large metal basket grabs the scummy fish and empties them into the opening of the elevator. The machine then lifts the fish and dumps them on a table where ten sets of hands are ready and waiting to sort them. The carp are thrown in one metal bucket and the smaller fish in another, and afterward, they are placed on the trucks in already prepared tanks. “There was a time before w started using machinery when there were as many as seventy people” one fisherman yells out over the noise. The workers would stand in two lines and pass the fish along. “We did it manually. By hand, we passed basket after basket, loaded them on the wagons and then they went to the warehouse. As the fishing is completed, the fish pond remains without most of its water as winter begins. At this time, Crna MLaka experiences the most significant invasion of birds. As the water level lowers, the old logs emerge, which disappeared a long time ago when the forest was first cut down. Hundreds of herons descend upon the tree stumps, standing as peacefully as statues that have been placed around to enrich the muddy landscape. Small birds flutter everywhere, and waders flounder around in still fresh mud. 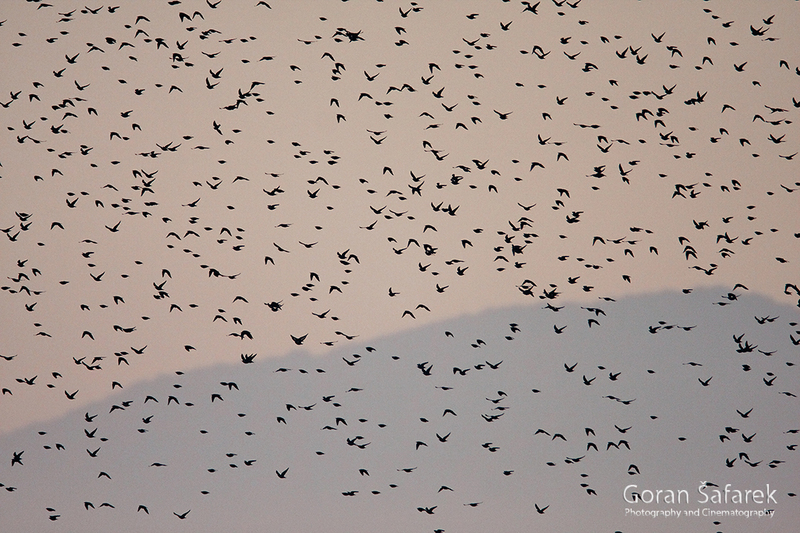 Cold days are ahead, and more and more birds will gather here, fleeing from the icy conditions in northern Europe. They are not bothered by the people who maintain the fish pond throughout the winter, as long as they keep their distance and do not come too close. In professional circles, there is a great debate regarding the symbiosis and the best way to protect the birds. Perhaps it would be normal to expect that they should be completely protected and that fishing should be moved far away from Mlaka. On the other hand, maybe the birds should be chased entirely away, and the fishing production intensified. Scientists have warned that both of these approaches would be a mistake. The disappearance of fishing would reduce the number of fish which would, in turn, harm the birds which feed on them. That would also disturb the entire ecosystem. These carp fishing ponds, with the abundance of birds and other animals, can only survive in an extensive fish farm. Not only that. Abandoned fish ponds would literally disappear, very quickly. The shallow waters would soon be swallowed up by the forest, in a perfectly natural process of eutrophication. The reeds and other plants would reign supreme over the water, and with time so much sludge would amass that the onetime free-flowing water would be taken over by bush sprouts. Everything would dry up, willow and poplar trees would grow, and in the end, the richly oak would return. There would be no more birds. Crna Mlaka is thereby living proof of the success of the coexistence of man and nature and the great natural heritage of Croatia on the world level.